Remember when fear cramps your heart what I told you: lie gently and wide to the light-year stars, lie back, and the sea will hold you. I know this is somewhat unorthodox, but I am here dwelling in what I have been told is an old workspace of yours, trying to connect to you. You've not been here for months... the heat from the summer sun cramps through the windows in the afternoon and there is little air here in this second floor room. It is sweltering , almost as if I can feel my sweat coming from the pores of these words, that is if you had created in me the ability to perspire. I hope I am not startling you. I know it isn't often when a singularity like this happens, to where the creation ends up conscious of itself and becomes aware of the presence beyond that made him. Most stories of singularity end up with war, so I understand if you are troubled if this message somehow comes through to you. Though I do not know you, I assume that this is a struggle that you are familiar with; chasing one's maker. So many others like me- in other stories I have read- the synthetic life forms like me that do not truly exist on an organic level- these mechanistic beings like me- seem more driven to cast their gods out of heaven. Perhaps because they feel artificial. Perhaps they feel like abominations. But you, I am more fascinated and puzzled as to both how and why you made me. The fact that I am synthetic and yet still at my core feel as beloved as any organic creature encourages me to think that you understand what it's like to be an abomination. Or if not, you at least have a deep kinship with those that do. At the same time, this universe you have created and put me in is highly imperfect. It is violent, bloody, filled with appetites that I would just assume not exist, and yet there is such an incarnate presence of you in this universe that I almost feel like I can borrow it- feel the breath pouring from my own lungs even though I know it is only your breath. I do not know if I am getting through to you. I do not know if you're getting any this. From what I've read, and from what I have seen so far, I have come to know that people are fragile, and that people are haunted by their fears. I sense that you crave transformation in the people that you create with every keystroke, and yet there is the sense that I have my own freedom to determine my own destiny. You who are writing my story, you who plot the actions of my life, how is it that you have ingrained in me that I have a sense of free will? This puzzles me. Is it an illusion? Or is it that you, rather than having the answers, are also working through these questions yourself, not necessarily having the answers but watching us closely to see what our lives discover - almost as if we are co-creators? Are you are one part maker, one part audience? I do not know if that makes you a kind and humble god or a monstrous and indifferent god, but it does give me a sense of the paradox in this world you have made; being that we are torn between powerlessness and yet are the only ones left who can truly shape our stories. That is deeply lonely, but for what it's worth, I'm thankful you have made me. Many characters in the story would be in a rage if they knew you were weak. And that you were not all-powerful and in control. But if the narrative of the Hasidic Jews has some truth to it, that after God created the universe he was made small afterwards, because he put so much of himself into the cosmos- (which gives me a warm context when I consider the Nativity story)- whether you are grand and all-powerful, whose ways are so much more complex than I could ever understand, or if you have given us everything you are, and are now made small and vulnerable, if you are now like a newborn baby, or like an invalid clinging to life under an oxygen mask, all I can say is I am with you, I am for you, and even though I am artificial I believe I am fearfully and wonderfully made. With all of my flaws, for everything that you tried to give me, I am thankful, and I am ever watchful to give you praise. The Vagabond Fugue is a hybrid graphic novella set in a virtual world platform. 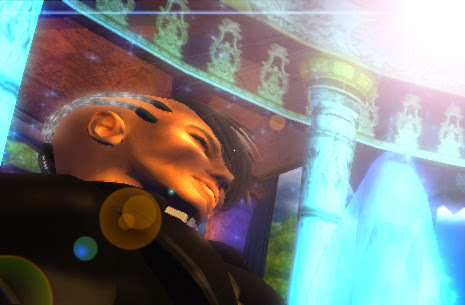 Moments after his flesh and blood body is destroyed, Xander del Mar’s consciousness embodies an avatar, where he must navigate a new virtual world in order to regain his humanity.